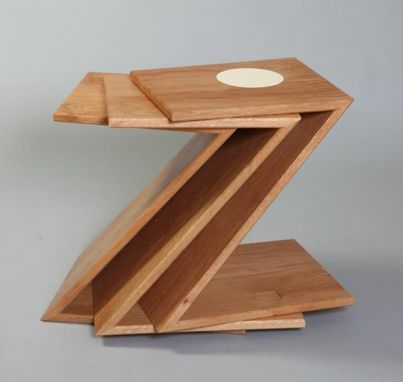 A take off on Gerritt Rietveld's classic Z chair design, this is a set of three tables that are also strong enough to sit upon. They make great overflow seating for parties. Each table has a unique inlay on the top surface, made of pigmented epoxy, some with various inclusions of exotic hardwoods or metal. This set is made os solid Oak. The mitered joints are splined every inch for strength.